I'm a Canadian and here in Canada, we don't have a ton of banks. We have around 5 or 6 major banks (Scotiabank, Royal Bank of Canada, CIBC, etc.) and basically no others (except a couple of credit unions). The branches of these banks are also pretty far apart. I have travelled to the U.S. and what I see there is very different. Looking out the window driving up a main drag in a random Floridan town I counted four Bank of Americas in 7-8 minutes. Also, there are more small banks. I travelled to Maine and there are these tiny banks such as "Bar Harbour Bank and Trust" or "Bangor Savings Bank" or "Machias Savings Bank". There are many branches of these banks. It just puzzles me how there are literally as many banks in Maine as there are in all of Canada. I hypothesised that these little banks are owned by a bigger bank and are just local things to make them feel more local. But I have really no idea. As an addendum to PeterK's answer, once upon a time, there were many Savings and Loan Associations (S&Ls) that acted as small banks, accepting savings deposits from people and lending money for home mortgages to local residents. Some of these S&Ls were chartered Federally with deposits insured by the FSLIC (similar to the FDIC which still insures deposits in banks) while others had State charters and used the State equivalent of FSLIC as the insurer. To induce people to save with S&Ls instead of banks, S&Ls paid higher rates of interest on their savings accounts than banks were permitted to do on bank savings accounts. Until 1980, S&Ls were not permitted to make consumer or commercial loans, have checking accounts, issue credit cards, etc., but once the US Congress in its wisdom permitted this practice, this part of the business boomed. (Note for @RonJohn: Prior to 1980, S&Ls offered NOW accounts on which "checks" (technically, Negotiated Orders of Withdrawal) could be written but they were not checks in the legal sense, and many S&Ls did not return these paid "checks" with the monthly statement as all banks did; writing a "check" while pressing hard created a carbon copy that could be used as proof of payment). In just a few years' time, many S&Ls crashed because they were not geared to handle the complexities of the new things that they were permitted to do, and so ran into trouble with bad loans as well as outright fraud by S&L management and boards of directors etc. After the disappearance of most S&Ls, many small banks (often with State charters only) sprang up, and that's why there are so many banks in the US. Mortgage lending is a lucrative business (if done right), and everyone wants to get into the business. Note that 4 branches of Bank of America in a Florida town is not a sign of many banks; the many different banks that the OP noticed in Maine is. Historically, branch banking in the United States - especially interstate branch banking - was viewed unfavorably by regulatory authorities, and this was codified with the enactment of the McFadden Act of 1927, which specifically prohibited interstate banking. Over the next few decades, some banks attempted to circumvent McFadden's provisions by establishing bank holding companies that operated so-called independent banks in multiple states. To address this, The Bank Holding Company Act of 1956 prohibited bank holding companies headquartered in one state from having branches in any other state. Most interstate banking prohibitions were repealed by the Riegle-Neal Interstate Banking and Branching Efficiency Act of 1994. Research has also found that anticompetitive state provisions restricted out-of-state growth when those provisions were more restrictive than the provisions set by the Interstate Banking and Branching Efficiency Act or by neighboring states. Some states have also had restrictive bank branch laws; for example, Illinois outlawed branches (other than the main office) until 1967, and did not allow an unlimited number until 1993. And here's a time-line of how they got there. I can't find a citation, but from memory (EDIT: and reading the newspapers at the time it happened): up until around 1980, banks couldn't cross state borders. In my state, at least, they were also very local, only staying within one county. This was to enforce "localness", the thought being that local bankers would know local people and the local situation better than far away people who only see numbers and paperwork. Actually it seems you are not quite correct about the number of different banks in Canada. According to this link there are 82-86 banks in Canada plus credit unions. This may still be lower than what would correspond to the number of banks in the US, scaled for canadian population. One further reason not mentioned before could be that the population density in Canada outside of the metropolitan areas could be lower than in the US, leaving to few small towns large enough (10,000+ (a guess corrected due to comment)) to support a bank. In the US, paper checks are still the rule, and there is a large amount of the population that does not care to use online banking. As a result, those people need to go to the bank once a week or more often, to deposit checks they get from anywhere, to get cash, etc. ; so all those little banks have traffic. This is slowly changing, and banks start to automatic the processes even in the brick-and-mortar location, but for now, they are around. Second, we can mix in service expectation. I expect that in addition to "good" online service, "great" phone service, "great" email service, that when I have a problem, don't understand something, or want to talk about my options for investing or choosing account types, that I am able to go into a branch. That I can "walk in" and see someone quickly, or schedule an appointment and see some one right away (at my appointment time). Together, these two options means that on a busy day, the nearest Wells Fargo Branch to me has at any one time, 50 - 60 people in it. Smaller branches, of course have less, and larger branches exist. So it just takes that many branches to address the number of people and their expected needs. Well that's just the USA. We believe in capitalism. 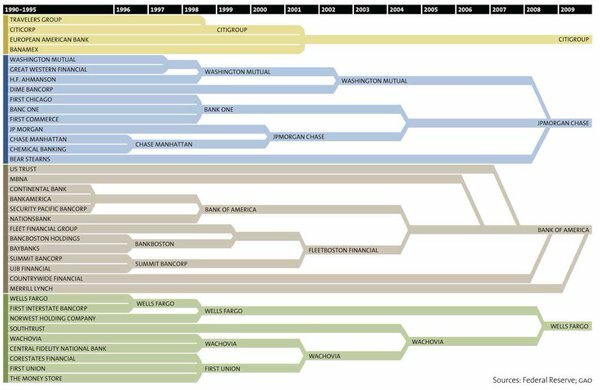 We have believed in it much stronger in the past, but banks are the central to capitalism so why shouldn't they serve as an example. So for some of us, we want a big bank like Wells Fargo, because we want the rates, structure, and service they can provide as a "big bank". For others they want the more personal touch of a "small bank". There are benefits both ways. For example there may be a bank that only allows people with excellent credit to open accounts. That allows they to have lower over all mortgage rates, but means their checking accounts have higher minimums. While the next bank may be more inclusive, and have smaller minimum balances, but as a result charge more for loans. We like our options, and rest assured all those "brands" offer products that have differences that attract customers. Not the answer you're looking for? Browse other questions tagged united-states banking or ask your own question. Is there more money in pockets or in banks? How to search efficiently for financial institutions, credit cards, etc (At least in Canada)? What is the downside to using the “First National Bank of GameStop”? How many bank tiers are there?